Corporate/University/Community Groups are welcome to volunteer at KEEN. Groups wishing to volunteer are asked to contact KEEN to reserve a program and a date, at kpeters@keenstlouis.org. 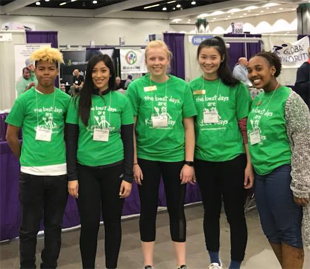 talks about the joys of volunteering with KEEN Athletes in The Training Edge,a magazine published for Fitness Professionals by NASM, The National Academy of Sports Medicine. KEEN is seriously committed to maintaining the privacy of our volunteers. At least 3 reference checks are completed for all volunteers. As part of these reference checks, a series of questions is asked to inquire about the suitability of individuals who seek to participate as volunteers in KEEN's programs. In the event a reference check suggests that an individual is not appropriate for service as a volunteer, this volunteer will be asked to refrain from further participation in the program.